I finally found a preparation for those anemic supermarket Camemberts, thanks to Czech bar food, which takes no prisoners. Nakládaný Hermelin is a garlicky Czech specialty I wish I had found in Prague last summer, but saw it on the internet instead. Hermelin is a bloomy rind cheese similar to brie, and it is pickled in big ol’ jars of spiced oil made heady by garlic, peppers, and onion. Of course, if you wanted to use an imported Camembert, my assistant and I wouldn’t say no. 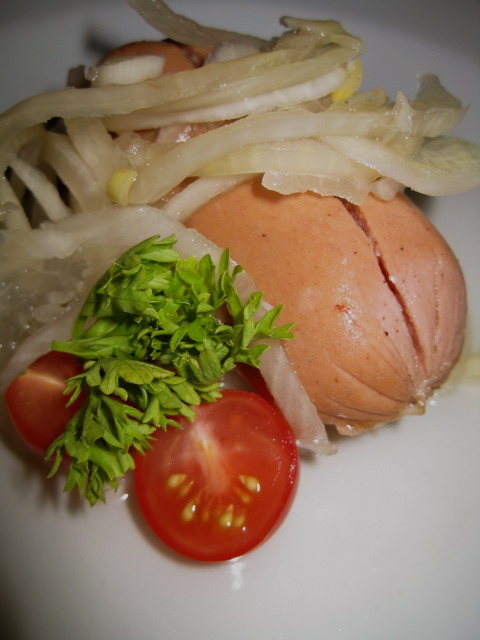 Nakládaný Hermelin hails from the same class of bar snacks as utopenci (“Drowned Men”): fine-grained miniature sausages, pickled in vinegar. See? Take no prisoners. 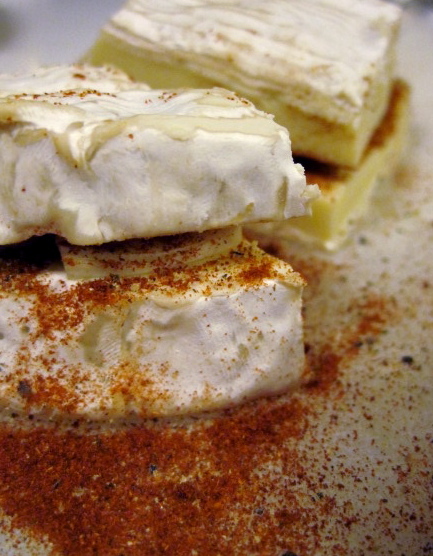 Preparing Nakládaný Hermelin is quite easy: just take a wheel of Camembert, slice it in half horizontally through the middle, press slivers of garlic and dust each half liberally with top quality paprika and pepper, then put the two halves back together. Slice in wedges so it will fit in your sterilized jar, then layer with onions, bay leaf, and pickled peppers, and cover in oil. I’ve adapted the recipe adapted from a blog called Northern Table and variations on this Czech food message board. I’d warn against any of the versions that suggest leaving the cheese on the counter to ripen at room temperature for several days or longer, however, or reusing the oil. You can get pretty sick by eating soft cheese left on the counter under any circumstances, and Camembert doesn’t quite have the acid one needs to stave off botulism in anaerobic (i.e., under oil) environments. What you’re losing is the ripening and oozifying of the cheese. By using pickled peppers you’d be lowering the pH even more, so, um, maybe…but I really don’t trust those garlic slivers in the center of the cheese. It’s just not worth the risk. And it’s still pretty darn good, all garlicky and spicy, after being refrigerated for a week. I wouldn’t waste your best, raw milk Camembert on this preparation either. Use pasteurized cheese, both for safety and budget. The garlic and oil will kill any subtle nuances of a good cheese, believe me. Before serving, I’d suggest taking out the wedges you’d like to eat and letting them sit at room temperature for a while (and I’ll let you decide how many hours is “a while,” with the food safety proviso that 2 hours max is the limit for prepared foods). As for the size of the jar, well, that’s up to you. 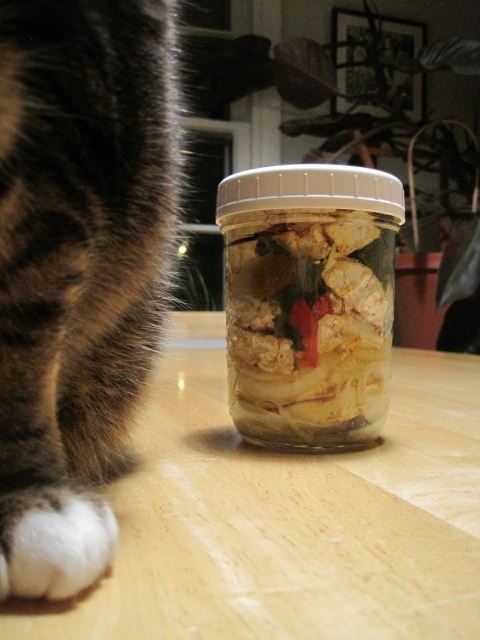 A quart canning jar for two small rounds of cheese seems ideal to me. I managed to squeeze a small wheel into a pint jar, just barely, for my first try, and had a hard time getting the oil to fill all the air pockets (also important for food safety reasons). Be sure you sterilize the jar by washing it well, then letting it go through the heat cycle of your dishwasher or boiling the jar for 10 minutes. This recipe is easy to scale up or down, and Czechs experiment with the spices to their own taste, so you can’t go wrong. The proportions here are estimated, since I made mine in a pint jar. I’d advise using more paprika than less, and less garlic than more. I’m not sure that I’m happy with using vegetable oil, since it didn’t add anything to the flavor of the cheese, but that’s what they use. You might experiment with olive oils. Other suggested spices are mustard seed, whole coriander, fresh rosemary (make sure it is completely dry), or dried hot peppers. You could also just add 2 tablespoons of pickling spices for a slightly different taste. Prepare a clean, sterilized quart jar (see notes above) and a lid/ring combo or a plastic cap. Refrigerate the cheese so it is as stiff as possible. Slice the onion thinly into rings, and slice the garlic thinly, then cut it into slivers. Thoroughly dry your bay leaves. If you have a mortar and pestle, crack the whole spices to release the oils. Prepare the chilled Camembert by slicing each wheel in half lengthwise, so you expose the inside of the wheel. Work fast and with a confident hand, because it is sticky and may fall apart if you mess around with the cut too much. Press the garlic into one of the exposed halves for each cheese. Sprinkle both halves of the interior with the paprika and lots of fresh black pepper. Rejoin the two halves of the cheeses, then slice into wedges that will fit neatly into the jar in layers. Layer the ingredients in the jar. Place several onion rings and some spices at the bottom of the jar. Use onions, pickled peppers, and bay leaves (and dried chiles if using) to separate the wedges, filling the gaps with more pickled peppers. Press the cheese down so it is firmly packed, but don’t pack too tightly. When you are about half full, add some oil and more spices. Press lightly with a spoon to release air bubbles. Keep adding cheese and other items until the jar is about 3/4 full, then top off with oil, again pressing down and checking for air bubbles. Add the rest of the spices. Make sure the cheese is fully submerged in the oil. Close with a canning lid/ring or plastic cap. Refrigerate for 1-2 weeks, checking after the first few days that the cheese is still submerged. When you’re ready, enjoy thin slices with traditional rye bread or a baguette, and some Czech lager. The cheese should taste very garlicky and cheesy — if any off flavors or odd colors or mold are present, don’t eat. Absolutely delicious! Thanks so much for sharing it with us. How fun! I used to live in the Czech Republic and remember seeing it out on displacy at the “hospody” as well as the utopenci you mention. It is very difficult for pathogenic bacterium such as botulin or listirium to grow in ripe or hard-aged cheeses such as the one above. Such cheeses have live, active spoilage/fermentation cultures that are much more robust and in direct competition with the baddies. The issue with leaving good, quality cheese out for days is more with moisture loss than with bacteria. The cheese will dry out and become unpalatable… unless you’re pickling it, then you kind of want it to dry a little! PLEASE NOTE: the same is not true of pasteurized, processed dairy products! The FDA treats all dairy products the same, whether or not they contain live microbial cultures. 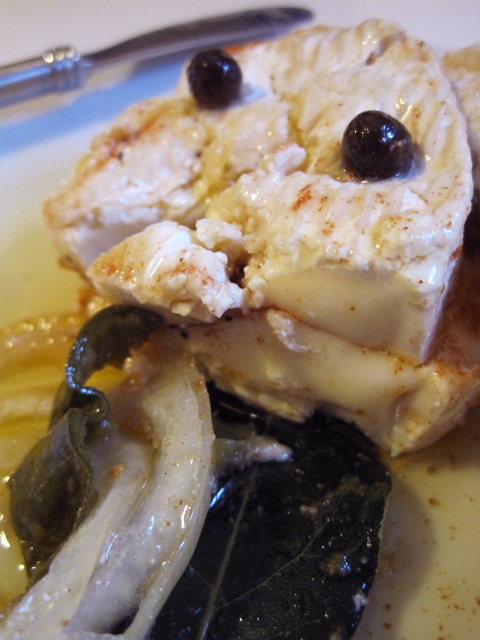 So is it OK to leave a hard, cave aged, french goat cheese out? yes. In fact, that’s how it was made. Caves aren’t refrigerated! My advice for this recipe is to definitely leave this out overnight, but do not break the rind, that white powder is bacteria and it keeps bad bacteria out, even if introduced by insects or other critters. I’d be much more worried about the garlic than the cheese as garlic is a breeding ground for botulin! Thanks, Ronin Chef. The only thing is that you really need to slice open the cheese to add the flavorings. So I’ll stick to my method of refrigeration. Well, it is a common snack especially in Beer houses here in CR, however I do not remember any kind of food poisoning. But to be honest if I prepare both, the cheese or the pickled sausages I always put them to the refriger. As you mentioned there are lots of recipes, I can offer one quite unusual but delicious: pickle the cheese in olive oil seasoned by garlic and ground green pepper. After few days serve it with pickled cranberries. As the pickled sausages need few days and you may be worried of botulotoxin, there is a “fast” version of “drawn men”: Put pieces of the sausage and onion into a jar, boil 8 spoons of water with 4 spoons of: worchester s., ketchup, mustard, oil and vinegar, season with chilli, pepper, salt, pour the hot pickle over the sausage and leave it in the refrigerator overnight. I know that those recipe will never be served in chefs restaurants, but try it with a piece of bread and a glass of cooled pilsner. It’s worthy. I had this cheese in a bar in Prague in 2001. It was (nearly literally) stunning! Never had anything like it before or since! Woof!